If I asked you to draw a full-size outline of your head on a flip chart, and then to draw the outline of your head as it appears in the mirror, would you draw the two outlines the same size? You shouldn’t do because the mirror image of your head (as it appears to you) is exactly half its true size, irrespective of how far you are from the mirror, a fact that few people realise. That’s according to a new study published in Cognition by Marco Bertamini and Theodore Parks at the Universities of Liverpool and California. They also found that most people believe the mirror image of their own head will grow smaller as they move away from the mirror – it doesn’t it stays the same. Yet most participants correctly realised that if they watched the mirror image of another person’s head, it would get smaller as that other person moved away from the mirror. Finally, only a minority of participants realised that the size of the mirror image of another person’s head would get bigger as they, the participant, moved away from the mirror. Confused? Me too. I did a casual duplication of the experiment on my coworkers, and it’s great fun. It’s all true of course–we just used pieces of tape to mark head size in the mirror, and walked back and forth, marvelling at the results. There’s a better way of understanding all this. (By better, I mean more coherent and more in line with simple physical theory.) When you look at yourself–or any other object–in the mirror the image is not at the mirror surface it’s behind it, exactly as far behind the plane of the mirror as the actual object is in front. It’s called a virtual image because no light rays actually go through it. And that, of course, is exactly what it looks like. Ask any cat who has tried to fight with its reflection. A mirror looks like a window through which you can see another world, one in which all the objects seems to be strangel reversed versions of the objects in your world. Your observations about tape on the mirror surface follow from this (well, OK, I’d never actually worked out this bit of it for myself) but they miss the point somewhat. The image of your head is not at the mirror surface! Putting tape on the mirror is a bit like putting tape on a window when you’re looking at an object outside. Put a mark on a mirror and then stand fairly close to the mirror and focus on your face. Is the mark in focus? No. My qualifications to say this: I have a PhD in physics, but I learnt this stuff in high school. I remember finding it pretty weird for a while, just as I found a lot of other physics weird. But it works! It’s the reason I love physics so much. The tape could just as easily be replaced with “the edge of the mirror.” It’s not meant to mark the location of the. To stick with your window example, suppose you are close to a window and have a wide field of view. It happens to be that a tree fills your view from top to bottom. Or suppose the tree is only a small portion of the field of view and you mark the top and bottom with tape. The tape is just a replacement for the edge of the window if the window is to big. Either you, you then as you move back. Your field of view shrinks and you can’t see the whole tree. But that’s for a window. For a mirror, the image is the same distance behind the mirror as you are in front. That would be like looking through a window and as you move back, the tree also moves away. Your field of view shrinks but the tree moves away so it also seems to shrink. If the tree filled up the entire view of the window, then as you move back it would continue to do so. I got around to reading the paper. I’ve quoted the first paragraph of the introduction below. It seems to me that the authors and the Gombrich they cite could have done well to pay more attention in high school physics. “The image on the mirror surface” indeed! There is a famous passage in Gombrich’s (1960, p. 5) classic book Art and illusion about the perception of our own head in mirrors. Gombrich points out that we see ourselves in mirrors without any conscious awareness of the size of the image on the mirror surface. He suggests a little demonstration on the fogged up mirror of our bathroom. If we circle the outline of our own head we will be amazed to discover that it is much smaller than our head. Indeed, it is exactly half independently of distance. To Gombrich, this is an example of an illusion in the sense that we are only aware of seeing ourselves face to face and we stubbornly refuse to see the size on the mirror surface. The size concept seems pretty simple to understand, but what I’ve always wondered was: Because we, when we look at a mirror, have a distance between it and our eyesight is based on distance, is looking at a reflection your face from 10ft in a mirror like looking at your own face from 20ft away? And another question: Does a mirror reflect images with the same “vision” the person looking at it has? ALWAYS half my size? I do think this is WRONG. I can prove it is wrong. If I put my face up directly to the mirror I can stare at myself eye-to-eye. And I can lick my own reflection, etc. My eyes must be aligned with the reflection’s eyes because I am pressed right up against the mirror. If I did the same thing to a real twin of myself everything would be the same. I would be able to see eye-to-eye with my twin and eyelashes would touch on both left and right eyes. Thus I am seeing myself at FULL size, not HALF size. Here’s the thing though: with a mirror, you’re not perceiving an object but the projection of an object. With a twin you’re perceiving an object. 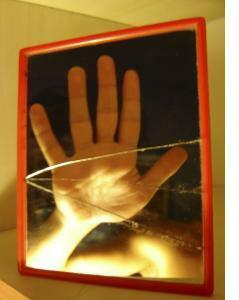 We physically cannot perceive the projection and only see the distal object some distance “into” the mirror. We know that the mirror is there and pay no attention to the 2D reflection, filling in a 3D understanding of the object being reflected. It’s all perception, your twin vs. reflection example is a great example of that. There are others who explain it much more eloquently than I can, try researching slant perception. I was thinking the same thing, Max Loh. Simple question, if you stand 3 feet away from a mirror, are you seeing your image from 6 or 3 feet away, it seems that a reflection could only reflect what is in front of it (a 3 foot away object)or is it all an optical illusion? Also, if your reflection is half the actual size of the real image from the actual distance of the mirror, then why in experiments do participants always over estimate the size of the object in the reflection? Please explain, I am not a moron.